I think I'm on a hot streak with these films now. This, I believe the last dramatic film of Lubitsch's career, is just as painful, cognizant, and important as the day it was made. It's a film that speaks to its moment when the generation of WWI had become fully grown and the face of madness would be elected in Germany in just one year's time. Unlike other great antiwar films of the era this purely deals with civilian life after way which is still a difficult subject that so few films are willing to speak to. To backtrack a little I discovered the existence of this film through Ozon's recent and wonderful remake Frantz which is subtly different in a way that speaks to how the conversation on war has changed nearly 100 years later. As an opening row of sabers shows this was a generation where everyone felt war. Likewise focusing on the guilt ridden soul of Phillips Holmes highlights who everyone was a part of the war unlike now where we are more in Barrymore's shoes as ignorant civilians who may feel the pains, but not know them. Returning to Lubitsch solely his empathy and depression in regards to the German people is amazing while also highlighting what time has not changed. Largely the German people are related by four figures. There begins with the dead as in the soldiers who have minimal voice and those hurt by the war and are in need of healing but are currently in pains over a truly unbelievable horror. This follows up with two major figures unaffected by war. There's the mostly mute members and trust and most dangerously the opportunistic elevators of hate using the pain of others for personal vainglory. Unfortunately as the play seems aware of that last group had won that moment, who knows in this moment, though it concerns itself more with that second group since in many respects it is the largest and most important group. There is nothing malicious in the nature of the old men who speak in hatred because of their hurt. Lubitsch never characterizes these people as villains even as he places responsibility for their pain upon themselves. Instead it becomes a battle for a nation's peace of mind and whether that can become a true peace and not merely a civilized one. Much of Lubitsch's concerns naturally relate to the home he seems aware he will never return to, but Holmes also becomes a powerful vessel by which to communicate the long term effect of war which wiggles into the brain like a disease, rotting and broken. These living victims need as much healing as the parents and widows. The film begins on the first anniversary of Armistice Day as the fathers blow cannons for their sons one of whom in hospital screams with the horror of PTSD as this celebration of him further rots his brain. In one simple cut with more intellectual and emotional power then hundreds of other films Lubitsch has summarized why we should avoid violence. At the beginning of the film Holmes is so weak that he just becomes a figure for others to place their emotions onto not taking in what he actually wishes to say or his actual history is. It is not until the end with violin in hand that he has become healed in any meaningful way as Lubitsch leaves us with a tenacious hope that would soon come to spoil. Where is Broken Lullaby available? I saw it through the Boston Public Library which has a Universal MOD disc. The transfer is very high quality given what I was expecting though the disc is very simple automatically playing with no menu screens. Barbara Stanwyck's small town hick latches onto a local bigshot John Boles, marries him, and then as soon as their daughter is born, gets her eyes set on hobnobbing with declasse nouveau riche, much to the unflappable displeasure of Boles. Soon the pair are separated and Stanwyck cluelessly tries to provide her teenage daughter with the socially desirable things she never received growing up. Only problem is that Stanwyck is helplessly gaudy and tacky and everyone secretly judges her. But her lack of guile means she putters on, to the detriment of her daughter's nascent social standing. The movie kept vacillating in how it presented Stanwyck's character, which in a better movie would be a plus but here it's just confusing. I didn't much like her, and I was stunned how long it took for the film to make it clear that I was supposed to be rooting for her! A better film would have not painted Boles as impossibly patient and understanding, or his new wife as so friendly and respectful of Stanwyck's claims to motherhood, or most tellingly, not made Anne Shirley' as the daughter so unwaveringly loyal to her ignorant mother. 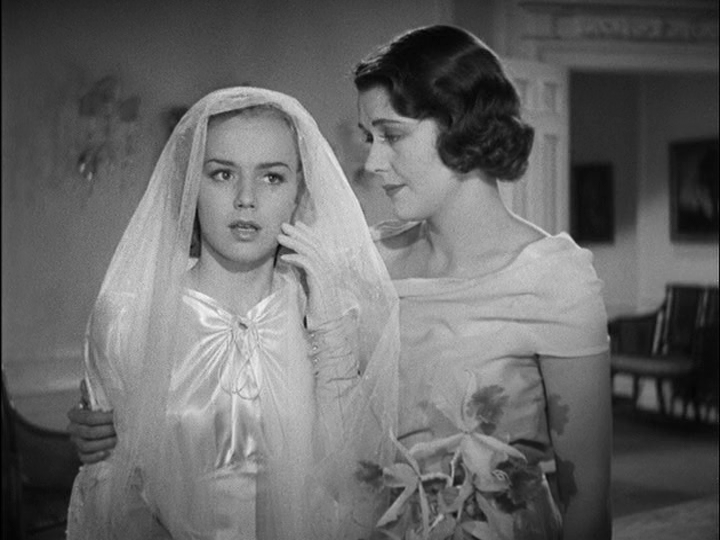 For a while the movie threatens to teeter into beating Mildred Pierce to the punch by almost a decade, but no, Shirley is so attached to her "selfless" mother that Stanwyck has to literally manufacture a crass collection of excuses to make her daughter hate her-- for the daughter's alleged benefit. Therein lies the biggest problem: the film is convinced this is selfless. No, it's selfish. The film goes to great pains to show how much Shirley loves Stanwyck, but Stanwyck decides for the both of them that she'd be better off in a social set that hates Shirley's mother. Again, a better film would find some ironic pleasure in the empty gesture of sacrificing so much for so little, but this movie wants to wring out emotion from all the mothers in the audience who can relate. Well, I'm not a mom, and for me the only character here who comes out well is the clueless daughter, and that's from a position of pity, not reverence. On a side note, I was tickled to learn Anne Shirley (who was nominated for an Oscar, in yet another pity vote for the character over the performance) took her stage name from her first and most famous film role, Anne of Green Gables! Curious to see the 1934 version now... I'll just add it to my queue of hundreds of other studio films from this decade alone! Hoping to contribute as and when with the 30's, although I've said that for several other lists over the years, so this may be it. The plot is absolute nonsense- anarchist attempts to murder a famous actress but only succeeds in wounding her, a trial and inexplicable romance ensues. The pacing of the film is all over the place- there's a courtroom scene that really has no reason to last as long as it does and the set-up is given far more time than the actual meat of the story and it's not until very near the end that the film spits out it's points about fame, etc. However, L'Herbier seems to be having great fun conjuring up as many visual flourishes as possible; scene transitions are accompanied by wipes, visual effects, double exposure, the camera swoops here and there whenever possible and shots are framed from a dizzying variety of angles. It can feel gimmicky but is often exhilarating. Boyer's all eyes as the Anarchist and you can see why he was on the verge of becoming a superstar, unfortunately Gaby Morlay looks a good 20 years his senior and gives a performance that regularly tips over into histrionics (although some of this is down to her character). Last but not least (but, actually, maybe least) of the starring trio; Michel Simon gives an outrageously camp performance as Morlay's manager, although the offensive eye-rolls and mincing are interspersed with a few hints of depth in the characterisation. Much like these ramblings, it's a mess. But despite its myriad flaws I have a feeling that there's plenty here that will stick with me- the two train station set pieces (one real, one constructed), the performance of the titular song where Boyer's resolve first weakens, and particularly the prison visit where Paulette Dubost's (Lisette in La Règle du Jeu) innocent visits Boyer, her face falling in and out of shadow through the grate and bars looming between them. Pathe have put out a really nice restoration on Blu ray in France which is English friendly for the feature but not the extras. It's by no means good in the way that Hitchcock's best films are good but there's some great stuff in there. The opening shipwreck scene is strikingly brutal and towards the end, in particular, there are a couple of silent sequences that are really beautiful (and perverse). My appreciation was undoubtedly aided by low expectations and by the fact that something about Laughton's performance clicked with my mood and, rather than finding it hammy and ridiculous (as I know many do) it struck me as extremely entertaining up until the point that it became quite moving. At best it's an enjoyable bit of fluff but was a pleasant surprise all the same. Barring any revelations on revisit, the lone Hitchcock on this list for me will be The Lady Vanishes. JI was one of my very first Hitchcock's which has given it an unfair sheen liking it for pretty much the reasons you say. The ship, even when it comes back later, is beautiful and there's about Laughton that for me just works. Obviously it is not notable in a career as great as Hitchcock's, but it is still fun most of the time. I feel a bit bad for hogging all of this space, but what else is there to do. Given how this is easily the most cinematic of Dickens' books it's quite surprising that this is the first adaptation I've seen. It's not even that long compared to other perennial adaptees like David Copperfield. This becomes something like a wash for future adaptations with the good things being nicely effective and the bad things really highlighting the difficulties this seemingly obvious choice for the movies may have. Chiefly among those problems is that tonally it doesn't fit the sort of style Hollywood is bound to place upon it. Dickens is a bit of a goof and having a passion for knots is probably more a virtue than with the seriousness that Conway and company forces upon scenes giving a false sense of drama. The comedy and the drama are separated in a way that just doesn't work. This flattening of tone also takes away the spice of the characters which is probably the thing any adaptation lives and dies on. Oliver is of course memorable, but she is literally just doing what she does in every movie. Colman in his role doesn't do much. His alcoholic is kind of boring as he lazily sits and yells at himself. As an aside has any studio actor been worse served by time than Colman? He doesn't really have the distinguishing elements that have served others to survive through parody and all of his roles, I have seen so far, just aren't memorable to the point where it can be easy to forget him entirely as I surely will here as even in the small minutes he is on stage Basil Rathbone proves infinitely more memorable and engaging. To end more positively, everything in France is very effective. The sense of desperation and stratification is well represented in the few glimpses we see. Everyone is far better engaged with the material and of course there's that pairing of Val Lewton and Jacques Tourneur that gives the film it's most effective excitement. It's shot not just on an amazing scale, but in a stylish way evoking silent cinema and even a little Eisenstein if slowed down. It's one of the most impressive sequences in a Hollywood film of this era I've seen. Colman seems to have a type as this is the second film in as many viewings to feature him as someone who looks suspiciously similar to another character. Also once again he gives a fairly indistinct performance for far more interesting characters to work off of. Fortunately those characters are a real murderers row. It's hard to choose an MVP here, but Fairbanks Jr, may be it. He really excels at these villainous roles with his slimy dandy being particularly effective ruling each scene he participates in. Massey is also delightful slime though the real surprise, except in who they are headed by, is how fabulous the heroes are. Niven and C Aubrey Smith is the comedy duo I never knew I needed and even poor Carroll as the little to do love interest gives a fun and surprisingly multifaceted performance just through looks. I've heard the criticisms and agree with a few of them, the film is overly long and the leads give surprisingly wooden performances, yet I kind of like this as an old style epic. It's an episodic, silly mess that doesn't know where it's going slow leaving me with few options to explain my pleasure in watching it, but here I am. At best I can say some of the big characters (like cartoon evil Claude Rains) just work so well off of the clean slate of sleeping Fredric March fits this episodic style well. It's almost galling to predict what ridiculous setting the next scene will present. Also apparently this only adapted half of what I have to assume is an insanely long book. This is something like Stalin's Opfergang with it heightened everything, homoeroticism, and passion for an ideology that makes not a lick of sense. I see that a lot of people take this to be an ironic poke in the eye which if true still doesn't paper over all of the film's weaknesses though might explain why I could enjoy it more than Harlan's mediocrity. It's hard to make out any particular part of the film given how wide ranging it is. The aesthetic for example has moments that are breathtaking like a six minute silent opening and others that play as a parody of Soviet enforced blandness such as the confrontation before the ball. Likewise the themes when taken at face value are disgusting with their only benefit being how easy it is to relax in their totalitarian incoherence. Yet the bourgeoisie setting and fantastical approach to life more familiar to German films of the era than Soviet begs for an interpretation of irony, which it seems modern critics have hearkened to, that additionally beggars the question what is this irony in service to. I suppose I'm glad to have seen this if just because it is such an unusual film that deepens my understanding of the time and place it was made in, but I'm still out on what its qualities are. I also prefer David Copperfield. I had mixed feelings about A Tale of Two Cities. One the hand, it's a grand production and intelligently played, but I did feel that the different sections contributed to a whole that wasn't completely satisfying story-wise (never read the book, though, so can't compare). I don't remember being awed by the French scenes like knives is recounting, but only that the depiction of the French revolutionaries was wildly caricatural. It's funny but I thought Colman was fine but that the film could have done with stronger actors in the other parts! (I hope to join this list project soon - unless life takes over...). Actually reading over your capsule from the Academy list my impression was that I liked it more than you which I guess is a funny mutual reading. While it won't be making my list I actuallly liked it a lot and do agree the French court scenes are just stunning. This is something like Stalin's Opfergang with it heightened everything, homoeroticism, and passion for an ideology that makes not a lick of sense. Well, I had never even heard about this film before, but the "Opfergang" comparison made me seek it out at once. And the comparison, somewhat to my surprise, even makes sense, but while I've always been able to make some sort of sense of Harlan's revelling in decadence, the depiction of the doctor's villa and lifestyle in Room's film not only came as a surprise because it is in a Soviet film of the mid 1930s, but also because the 'inequality' of the lifestyles in the ideal society the film wants to depict is even defended by the film pointing out the achievements of some 'geniuses', be they artists, doctors, or philosophers whose work must be respected and adored. And I don't think that any of this is necessarily meant to be ironical (after all the doctor saves the life of that female Komsomol leader!). So I can't really make any sense regarding the 'message' of this film. Anyway, what really floored me about it is how 'formalistic' and experimental it is. The central sequence with the musical performance in the house of the doctor seems to come straight out of a French avantgarde film of the 20s (I couldn't help thinking of L'Herbier's "L'inhumaine" or even Man Ray in places), and all throughout the film Room comes back to florid designs or fences that structure the image without seeming to have any other function than providing pure 'form'. This is exactly the kind of thing that I adore, but I simply wonder how something like this could have been made under Stalin. And yes, there are probably some similarities in style to some German films of the era,too, but if so, it would rather be Weimar than Third Reich in the somewhat irreverent approach to, well, almost everything... In any case, the depiction of the doctor's wife reminds me in some way of some of Brigitte Helm's roles from the early 30s. So, not sure what to make of it, but I must say I'm impressed. I think it is supposed to be a defense of the Stalinist conception of a vanguard, but even with that in mind it's total nonsense. Room and the script writer were at the time banished to Ukraine so it is very likely not all was cleared by the bureaucracy and a lot did not sit well with the censors. Still, it's shocking the film exists at all. Read the whole piece carefully and found it extremely interesting and instructive. Now White Woman, In Name Only, and Vigil in the Night are on their way to me. Thank you! (I already had the obvious ones and the Glamour Collection). Glad you enjoyed the writeup, Tim. Hope you'll weigh in with your thoughts on the films you picked up in the linked thread! I'll echo the praise for the Lombard write-up and having watched Hand's Across the Table recently can wholeheartedly agree with your assessment of MacMurray in that film, his insufferable prick act is, unsurprisingly, insufferable. I’m in the process of working through the 30’s Duvivier’s I have knocking about. A visually and aurally striking piece of work, with an extremely impressive central performance from Baur. Duvivier and his cinematographers switch between a sort of airy despair with empty spaces hazily lit to harsh, vivid close-ups. Although the highlight for me was the scene set around the Paris stock exchange, with people rushing through the streets towards the commotion caused by Golder’s actions. It’s really dynamic, exciting filmmaking. The sound design is even more remarkable- particularly in the closing scenes. It’s a grim film but it was never less than enjoyable for the aforementioned reasons. There are some troubling aspects regarding the representation of the main character (as discussed, now one-sidedly, by Knives in the Eclipse set thread) and there’s no doubt certain stereotypes are reinforced by both Golder and some of the supporting characters. The source material, revisions made in adaptation and the complex (and tragic) story of Nemirovsky are touched on in Michale Koresky’s liner notes in the Eclipse set and there’s little of worth for me to add, particularly as I haven’t read the novel. However my experience of the film was that, with this stereotype as a starting point, Golder is rendered by both script and performance as an extremely complex character and an even more complex point of reference for the viewer. Golder’s never less than sympathetic, to some extent due to Baur, as well as the balls-out awfulness of the characters around him. But there’s no real redemption for him in the usual sense, nor in fact any quest for redemption, his initial actions are driven not by charity or remorse for the suicide of his ex-partner (although this clearly weighs on him) but by an existential (nihilistic) crisis. He just checks out for the sake of his physical and mental health. His (suicidal) re-entry into business is based on a re-ignition of paternal love for a woman who is revealed not to be his daughter but is still able to manipulate him into, effectively, sacrificing himself for her to marry her preferred suitor, and live the life of luxury to which she’s become used (she actually blames him for her not being able to exist without luxury due to her upbringing). The last scene is not just stylistically intriguing- thematically it seemed to suggest Golder returning into his past, culturally and spiritually, but also that the cycle was starting again with his provision of ‘start-up’ money to a younger version of himself. I may well be misreading some aspects of this, so would be really interested to hear any other takes. A re-watch really cemented what a great film this is. One of my favourites from the period, and features Gabin giving one of the great star performances. If I had to show someone an example of what sums up the ‘magic of the movies’, I’d show them the first encounter between Gabin and Mireille Balin in this. Will feature high on my list. I’m hoping to fit in a re-watch of the almost equally sublime La Belle Equipe (1936), which will also be in the mix. Have you seen the American remake, Algiers, staring Charles Boyer? It's more or less a shot for shot remake, but the change from Gabin to Boyer has a radical effect the speaks grandly about both actors. I actually preferred on recent watch Boyer's performance, and thus film, because of the sickly greaser personality he shows which makes more sense to me than Gabin's disaffected one. I saw you mention it in the Lombard thread. I've only seen the comparisons on the Pepe disc and thought it looked like more of a curiosity for the shot by shot nature of some scenes (and slightly softened ending) than anything worthy in its own right. Your recommendation and my recent enjoyment of Boyer's performance in Le Bonheur means I'll give it a go though. Selznick imports Ingrid Bergman to Hollywood in a remake of one of her Swedish films. I haven’t seen the original, and nothing here makes me want to change that. Leslie Howard is a famous (and married) violinist who falls for his daughter’s piano teacher, Bergman. The two exhibit zero chemistry together, making their already unlikely romance even more preposterous. Selznick has a way in many of his films of distilling audience manipulation down to the level of insulting the viewer, and that’s never been clearer than it is here. I was genuinely shocked at how poorly made this film was, how its speedy rush to hit all of the plot points in a mere 69 minutes led to a hurried and unconvincing dramatic sweepstakes where no one watching has the winning ticket. Not unlike Hepburn above, Bergman fares poorly in her “debut,” as her perf is so clearly attached to physical direction that it becomes obvious while watching what she was told to do in a given scene (“Keep smiling,” &c). John Barrymore is a highly moral schoolteacher who is fired for refusing to change his grades and finds his naïveté exploited by a rich industrialist who hires him to publicly front for the virtues of his health tonic. The message of the material— that life is unfair and virtue is not always rewarded— is cynical yet accurate, but also not particularly novel. The film is based on a play by Marcel Pagnol, and he later directed his own adaptation, but I can’t imagine any other version of this working than this solely because Barrymore’s performance is the only reason to watch this. Barrymore is not the first name I think of for “understated,” but it's his subtle humor and laidback pacing that make this a success, albeit a minor one. The role was apparently played by Frank Morgan on Broadway before it was adapted for film, and while I would have been curious to see how a similarly bombastic performer like Morgan would have pulled this meek character off, I’m grateful we got Barrymore instead. In contrast, Myrna Loy’s role here is inexplicable in its nothingness, and hints at perhaps elements in the source text that didn’t make it over to this relatively short feature adaptation. I haven't seen the American version, but the Swedish version of Intermezzo is actually quite good. It's not my favorite of her Swedish pictures or the era, that would be A Woman's Face which also got an American remake, but it has a sensitivity towards her that helps prevent the film from being poisonous which it could be given the delicate rope with her other half. knives wrote: I haven't seen the American version, but the Swedish version of Intermezzo is actually quite good. It's not my favorite of her Swedish pictures or the era, that would be A Woman's Face which also got an American remake, but it has a sensitivity towards her that helps prevent the film from being poisonous which it could be given the delicate rope with her other half. My favorite of the 30s films in the eclipse set is the delirious Dollar which I think I like for all the reasons some adore Guitry. When the titular unsinkable Molly brown esque loud American shows up to push the films hysteria even further I completely adored the ridiculous and hilarious dramatic/comedic escalation. But a womans face is really stinking good too, and that insanely iconic unforgettable torchlit sleigh ride chase sequence across a frozen lake is just a phenomenal moment, and that beyond perfect ending, wow. Count of the old town is like a second rate lubitsch knock off, charming, quirky, cheerful, and bulldog Drummond level of dumb b movie plotting. It is charming enough that you wish it were actually great.